I love the Game of Thrones on HBO, a show that has remained as true to the novels as possible and still maintained great pacing and a perfect serialized plot. 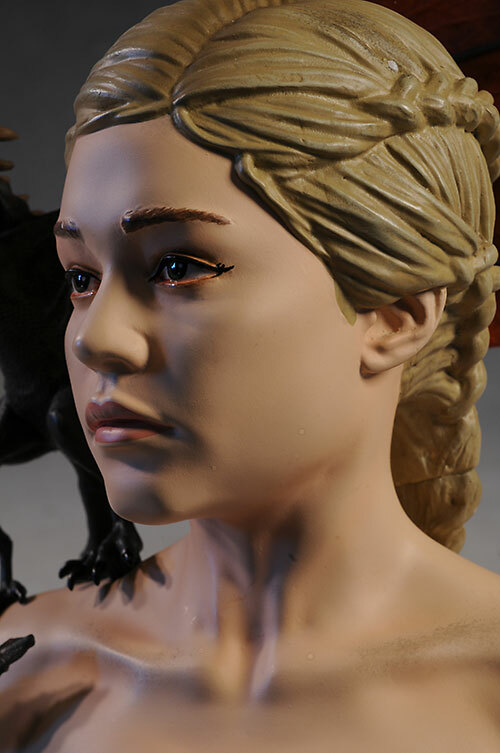 There haven't been a lot of collectibles so far, so the announcement that Dark Horse was producing a series of busts and statues, sculpted by Gentle Giant, was welcome news. 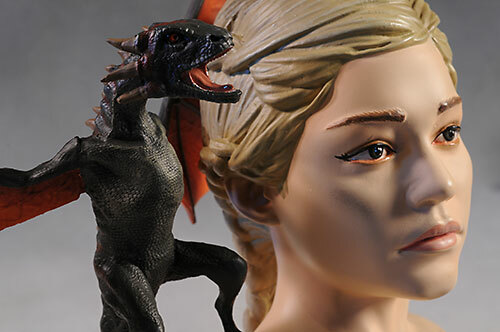 The first release is a bust of Daenerys, complete with one of her new born dragons perched on her shoulder. This is intended to be her as she rises from the ashes at the end of season 1. This is a limited edition bust, with an edition size of 2000 and numbering on the bottom of the bust. 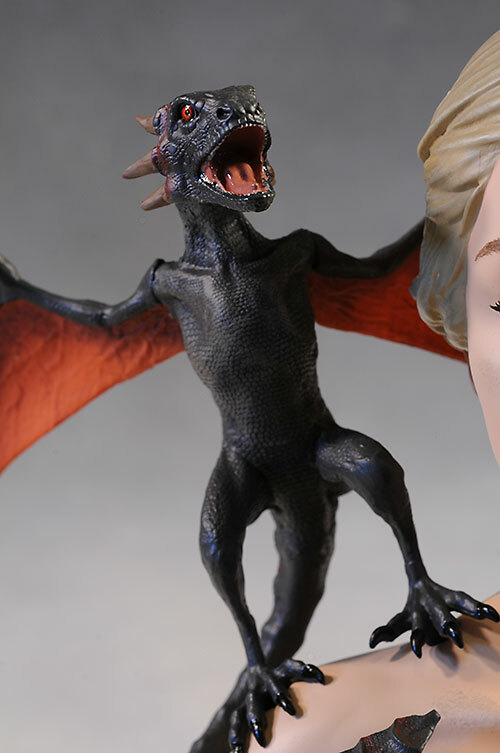 There's also an Entertainment Earth exclusive version, with a slightly different paint job on the dragon. You can expect to pay around $125 for this bust, depending on the retailer. I suspect you'll actually get a better deal soon, as I don't think a lot will sell at that price point. 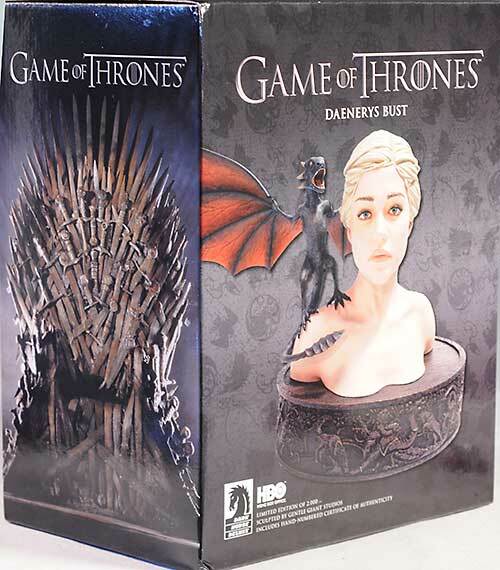 The box uses artwork of the actual bust, as well as other future releases like the throne itself. It's not the most exciting box, but it does keep the bust very safe. There's also an attractive Certificate of Authenticity, always a nice touch. 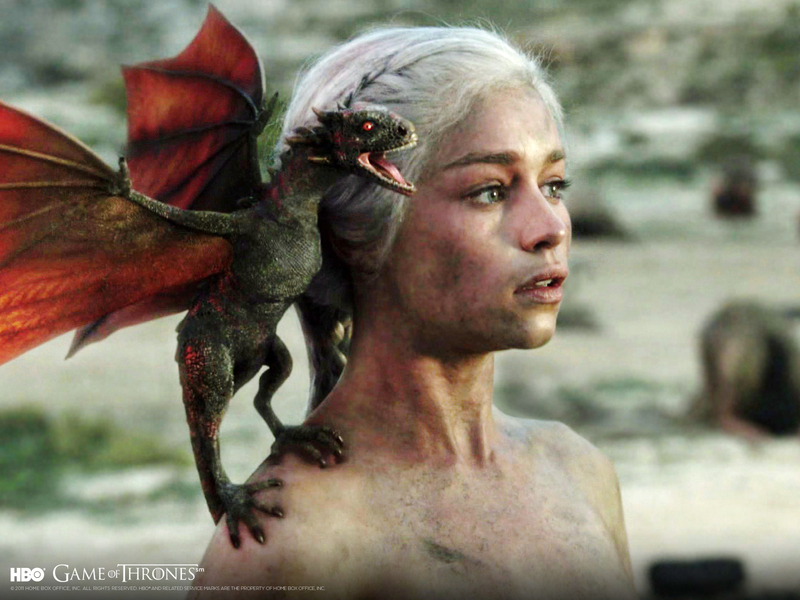 If you'd like to see exactly what Dany looked like in this scene, just check out this screen capture. 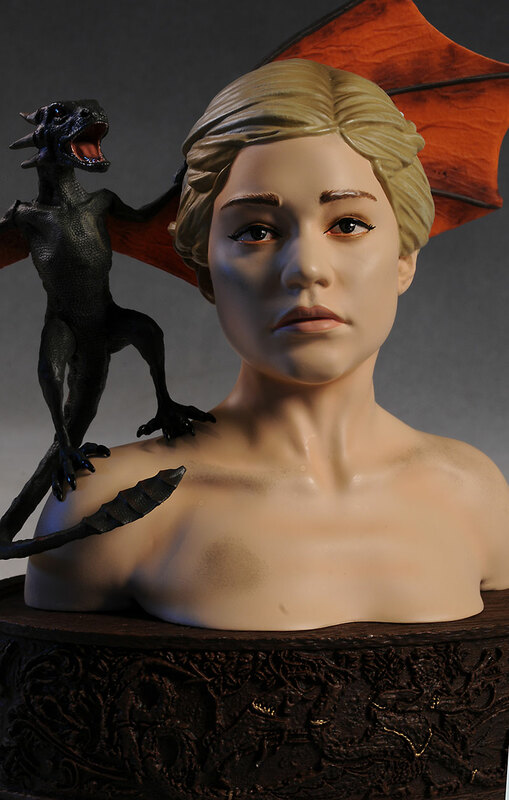 Daenerys is a beautiful woman on the show, and deserves a sculpt that brings that to the front. This isn't it. I can find some of Dany in there, more in the profile than straight on. But while there's a little likeness there, it's not enough to make here instantly recognizable without the dragon. And it's in the dragon that's the real beauty lies. There's lots of fine texture, small details and realistic veining in the wings. He's impressive, and is the highlight of the bust. 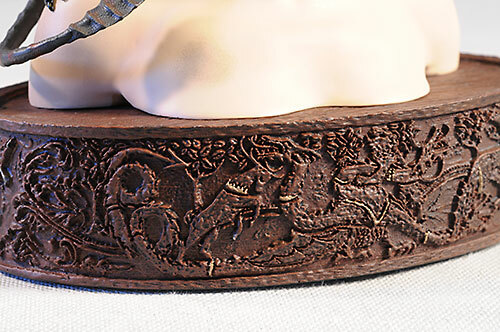 The base is encircled with various symbols and emblems from the show. There's the stag, and the lion, etc. They aren't bad, but are so small that it's difficult to make out much of the detail. I wish she had a bit more skin texture, something to improve the overall smooth porcelain look of the shoulders and neck. It doesn't look as high quality as the price would suggest. The other problem is the flat, lifeless expression. This was an ultimate moment, and yet she looks completely detached, practically stoned. This reminds me of the sort of sculpt we see when Gentle Giant relies on their scanning technology too much, and don't add the life and style that only a human sculptor can include. It's not like she was overly expressive in this scene, but the lack of any life here detracts from the look. The bust is fairly large, coming in at about 7" tall including the base. The wing span o the dragon is what really makes it seem bigger than usual. The paint is much like the usual Gentle Giant bust - a bit too broad and heavy. This bust is from the scene at the end of the first season, when she rises from the ashes. They tried to replicate that with some smudges on her body, but they just don't work. Instead it looks like bad paint, not ash. In the scene, it was heavy - here it's splotchy and sloppy. There's also some obvious effects like the lip line for definition, that's too obvious for this scale. The hair color isn't helping either - on the show it's beyond white, while here it's more of a corn silk blond. I'm sure it would have been difficult to get the perfect color, but this is way off. We've been spoiled by the high quality, realistic paint work provided by companies like Hot Toys, Enterbay and others. It forces everyone else to step it up, and if they can't, it's much too apparent. 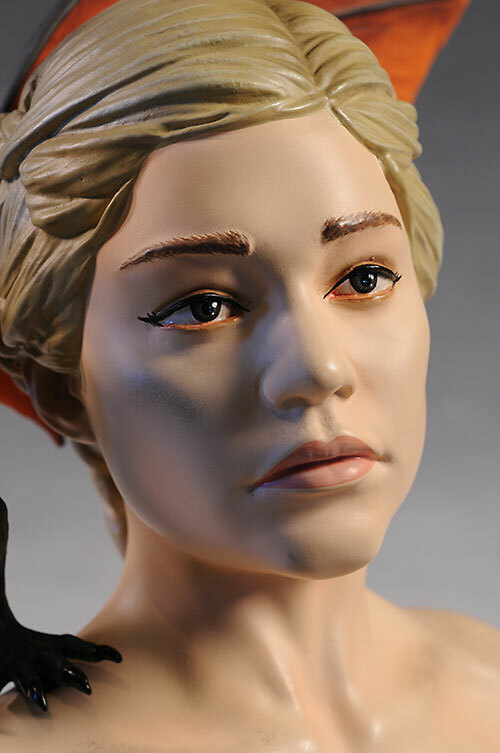 Most mini-busts are around $50 - $70 these days, including those licenses like Star wars and the Hobbit. This bust is going for around $125 at most retailers - twice the usual price. Sure, the dragon adds a bit to the value, but not double, and while it's a nice sized bust, it's not big enough to rate this price tag. 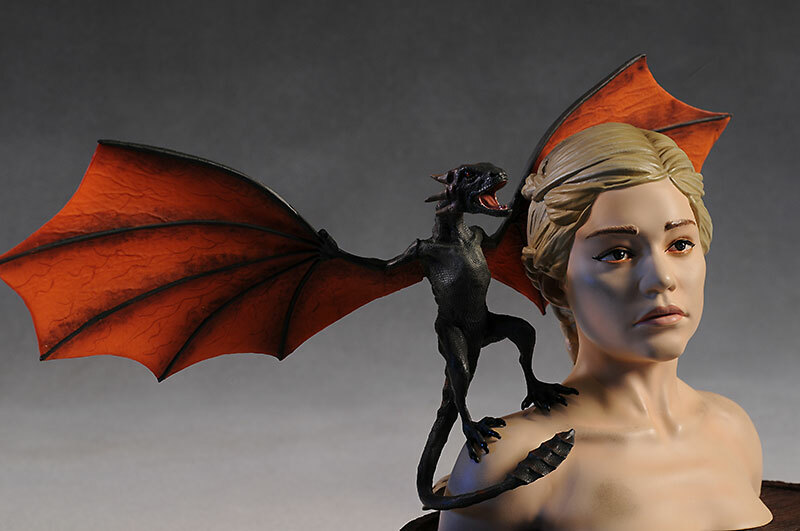 Take care slipping the metal rod on the foot of the dragon into the shoulder of Dany. Ever get a collectible out of the box and ponder "what the Hell was I thinking?". Yep, this is one of those times for me. 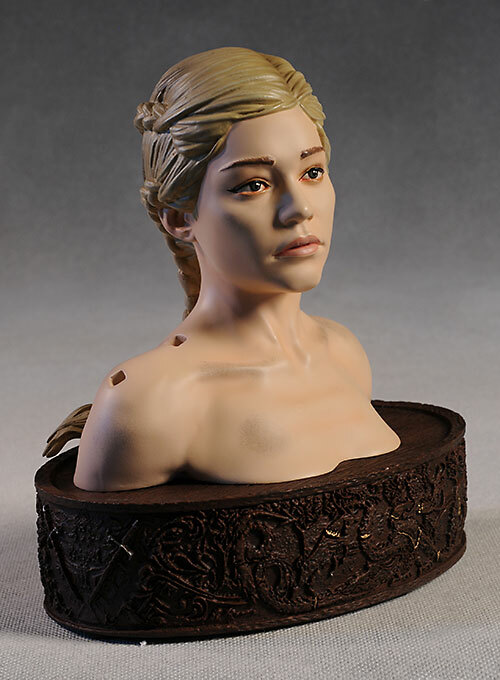 I wasn't thrilled with the appearance of this bust when I saw it at SDCC last summer, so I'm not sure exactly what possessed me to pick it up, unless it's just that there's so little Game of Thrones merchandise out there, and I was just starved for a fix. If this bust were closer to norm in price, say $60 or so, I'd be less harsh on the overall score. But at this excessive price point, the lack of detail work on the sculpt and slightly off portrait are all the more painful. - has it for $125. - has her at $112. - Entertainment Earth has their own exclusive version for $125, as well as the regular version for $125. I did check out the Hand of the King pin released awhile back. I was much happier with it!